Two forces with a contrasting impact on fertility have typically been overestimated in both scientific writing and the popular press. A marked postponement of fertility (by four years of age) causes fertility to decline by only about 0.2 children per woman. 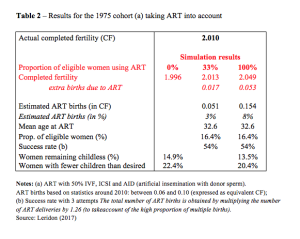 Lower still, according to Henri Leridon’s estimates, is the impact of ART, or assisted reproductive technology: even in an “extreme” scenario it could increase fertility by no more than 0.05 children per woman. Since the 1960s, there has been a notable decline in both cohort and period fertility in Europe, and a rapid 3-4 year increase in the age at first birth. At the same time, recourse to increasingly effective assisted reproductive technology (ART) has become much more widespread. Whether this growing recourse to ART reflects a decline in male and female fecundity (the ability to conceive and deliver a child) is debatable (Leridon and Slama, 2008). Here, however, we will focus on a different topic: lower completed fertility may be partly due to birth postponement, because fecundity declines with age, and ART may be used to counter this effect. With the help of a simulation model, we will try to gauge the impact of both phenomena (postponement and ART) using the French case as an example, (see Leridon 2017 for details). A woman’s reproductive history usually begins with the formation of her first union, not necessarily a marriage. The desired number of children and the desired birth spacing then comes into play, together with contraception, which is never 100% effective (except for sterilization, but this is very rare in France before age 35). In short, a small risk of unplanned pregnancies must be taken into account. Couples who do not use contraception do not have children immediately: there is a certain “waiting time”, usually of a few months, which depends on the monthly likelihood of conception, or fecundability, which is typically well below 100% (Bongaarts, 1975; Leridon, 1977; Wood, 1989) and declines with age. The age at the onset of permanent sterility (which should not be confused with age at menopause – Stanford et al., 1987) must also be taken into account. Following a conception, the pregnancy may not end in a live birth: the risk of spontaneous fetal mortality is non-negligible, and increases significantly with age beyond age 30. It is, in fact, the primary factor in the reduction of fecundity as age increases (Leridon, 2008). Let us get back to the waiting time: if it becomes too long, which may be due to complete sterility, low fecundability (subfecundity), or simply to chance, couples who want children may decide to use assisted reproductive technology (ART). The main methods used today are in-vitro fertilization (IVF, excluding ovarian stimulation alone) or its variant, intracytoplasmic sperm injection (ICSI). Effective implementation of an ART method may take some time, involving visits by the couple to specialized physicians, time for reflection, medical preparation for the intervention (for example, cycles of hormonal stimulation), and waiting times for treatment in a specialized centre. Consequently, several years may elapse between the couple’s initial decision and a first attempt at IVF or ICSI, as most studies have shown (Troude et al., 2012). France is an example of a country where fertility has remained relatively high in comparison to the rest of Europe. 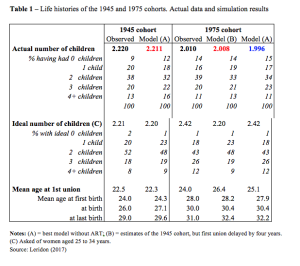 I will focus here on the comparison between two cohorts: the 1945 cohort (whose completed fertility was 2.22 children per woman) and the 1975 cohort whose completed fertility (on the basis of the data observed up to 2015) will probably be about 2.01 (Table 1). The main difference between these two cohorts is the sharp increase in the age at first birth, which rose from 24 years for the former to 28 years for the latter, and this gives us the opportunity to estimate the impact of the change in the timing of births. To compare the two cohorts, I first designed a model and used all the variables described above (union formation, waiting time, desired number and spacing of children, etc.) to “run” it, i.e., to estimate its parameters. Then, I shifted the distribution of entry into union of the 1945 cohort by four years, without changing any other parameter of the system. This gives us an idea of the effect of postponement alone (Table 1, central column of the 1975 cohort). The estimated completed fertility is 2.008 children per woman, which is basically the same as that actually observed for the 1975 cohort (2.01). In short, postponement alone could explain all of the observed changes between the two cohorts (–0.21 children per woman). However, this simulation assumes that nothing else changes, which is patently false. 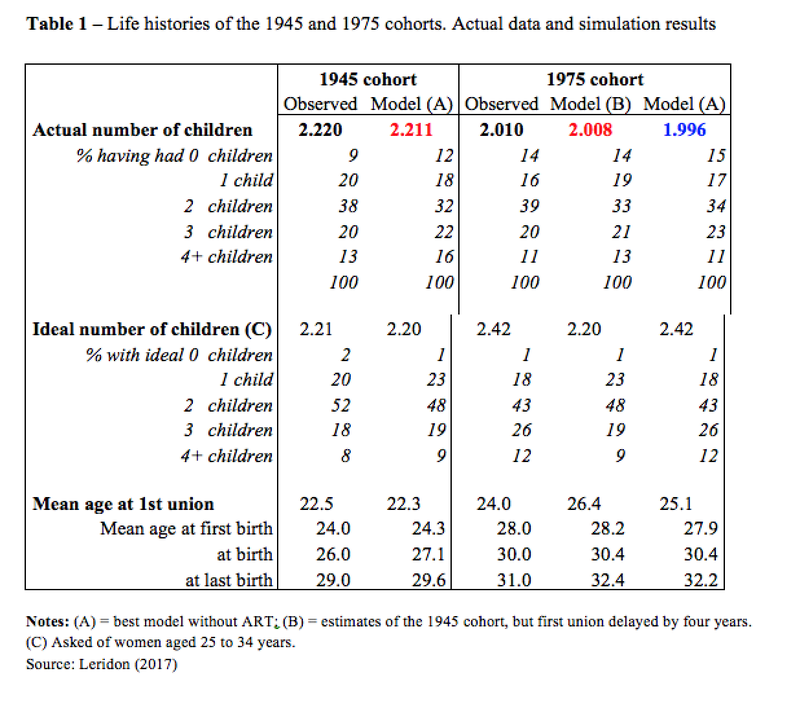 Therefore, the right-hand column of Table 1 shows the results of a more realistic model, which uses various data available for the 1975 cohort, such as more effective contraception (which depresses fertility) and a higher ideal number of children (which inflates it). Further, the average age of union formation is now shifted by only three years (instead of four) which is closer to what actually happened, but this effect is offset by longer spacing to maintain the same age at first birth, and at all births (which, as I said before, is delayed by about four years). Finally, I assumed no ART at all. This produced a result of 1.996 children per woman instead of 2.010. If all other the parameters were correctly estimated, the difference between the two (+0.014) would give a rough measure of the effect of ART, which was indeed available and used. But we will give below a more reliable estimate of the contribution of ART. Table 2 gives some complementary results on the use of ART for the 1975 cohort. Differences in completed fertility are reported (all estimated with my model): without ART (left-hand column, as shown above), with a “realistic” use of ART (centre column), and with a theoretical (“extreme”) use of ART (right-hand column). “Realistic” means that about a third of the women “eligible” for ART actually use it (and this produces an estimated fertility which is very close to that actually observed), and “extreme” means that all women eligible for ART actually use it. In both cases, “eligible” should be interpreted according to the definition of the model as rapidly outlined above (i.e., when the waiting time becomes “too long”). What do we see? Of course, the values obtained with ART for completed fertility are higher (+17‰ in the “realistic case; +53‰ in the extreme case), but the increases are small, probably smaller than one would expect. This is because a large share (and even a substantial majority) of the births obtained via ART would have occurred in any case, since many of the women seeking assistance from ART are simply subfecund and not completely sterile. The births would have happened naturally, but later, sometimes much later, which explains why couples did not wish to take the risk of waiting. In short: not all ART births translate into increased completed fertility, and the overall impact remains limited, even under the most extreme scenario. I applied the same model to the Italian and the Austrian case, and I obtained similar results, taking into account the differences in actual histories of these cohorts. Overall, my simulations show that in terms of completed fertility, the biological effect of a delay of 3 to 4 years in the timing of the first birth is limited, at between 0.10 and 0.20 children. The actual change has often been greater (e.g., in the Italian case) and this is due to other relevant behavioural factors: desired number and spacing of children, contraception efficacy, etc. Can ART counter fertility decline in modern society? Only up to a (very limited) point, according to my estimates: +0.02 is the figure that it seems reasonable to expect in the current conditions (efficacy of the techniques and frequency of use), and maybe up to +0.05 if all eligible women used ART. Leridon H., 1977, Human Fertility. The Basic Components, Chicago, University of Chicago Press, 202 p.
Leridon H., 2008, “A new estimate of permanent sterility by age: Sterility defined as the inability to conceive”, Population Studies, 62(1), pp. 15-24. Leridon H., Slama R., 2008, “The impact of a decline in fecundity and of pregnancy postponement on final number of children and demand for assisted reproduction technology”, Human Reproduction, 23(6), pp. 1312-1319. Troude P., Bailly E., Guibert J., Bouyer J., de La Rochebrochard E., for the DAIFI group, 2012, “Spontaneous pregnancies among couples previously treated by in vitro fertilization”, Fertility and Sterility, 98(1), pp. 63-68. Wood J., 1989, “Fecundity and natural fertility in humans”, in Milligan S. (ed. ), Reviews of Reproductive Biology, Oxford, Oxford University Press, pp. 61-109.